Dendera is not an easy book to read. Although the cover copy describes the story as being set in “a utopian community” of old women, this is no tale of feminist empowerment. Rather, every page practically bleeds with suffering and human misery, and the only salvation for any of the characters lies in death. In the Village, there is a strictly enforced rule that everyone must Climb the Mountain when they reach the age of seventy. Men and women who reach this age are carried on the back of their oldest child, who leaves them in the wilderness so that they may ascend to Paradise. That time has come for Kayu Saitoh, and she is ready – all she wants is to lie down and rest. As the snow falls around her on the Mountain, she embraces the sensation of her body becoming cold, knowing that when she sleeps, she will not wake in this world. Right before she passes out, however, Kayu Saitoh is rescued and taken to Dendera, a settlement formed on the Mountain by all the women who were abandoned by their families and left to die of exposure. Dendera is little more than a collection of flimsy huts, but the community of fifty women has supported itself for more than three decades. These women don’t want to die, and so they rescue each other, eking out a meager living from the harsh environment. The leader of Dendera is a woman named Mei Mitsuya, who founded the settlement because, as she says herself, “I had no intention of dying.” Mei Mitsuya hates the Village, but simply staying alive is not revenge enough for her. Her ultimate goal is therefore to accumulate enough resources to attack and destroy the Village. This is easier said than done, however, as life is not easy on the Mountain, especially for a small group of older women. They barely have enough to eat, and it is only by monitoring the community’s food supply that Mei Mitsuya is able to maintain her control over the other women. Kayu Saitoh, who is resents being robbed of the opportunity to die a “pure” death, feels no gratitude toward Mei Mitsuya or any feeling of investment in Dendera. This sense of detachment allows her to see the power dynamics of the community, especially the tension between the “hawks,” which is what Mei Mitsuya’s faction calls itself, and the minority group of “doves,” who seem to want nothing more than for the village to prosper. This conflict is subtle, however, as the main concern of the Dendera inhabitants is feeding themselves. After all, no one has much energy to spare for anything besides hunting, scavenging, and rudimentary farming, not to mention the care of those too senescent to care for themselves. Unfortunately, the old women aren’t the only ones going hungry, as this particular winter has been especially fierce. A large bear who has established her territory on the Mountain is starving, as is her cub. She eventually becomes desperate enough at attack the human settlement, which throws the tiny society into complete disarray. As Kayu Saitoh watches everything fall apart around her, she begins to catch glimpses of Dendera’s dark secrets. The bear is a terrible enemy, but this creature is far from the most frightening threat besieging the community. If you want to read about old women being evil to each other in a wilderness setting, Dendera is your book. I found myself fascinated by this story, especially when it became clear that there was a deeper mystery underlying the basic struggle for survival. I appreciate just how unapologetically mean and selfish each of the women is, and this darkness of characterization served to render their rare moments of kindness and cooperation shine all the brighter. I also enjoyed the interludes of narration from the bear’s perspective, which don’t attempt to attribute her with human characteristics but still engender a strong sense of sympathy for her own struggle to survive. Although the story isn’t set in any particular time or place, it might be possible to read Dendera as an allegory for the precarity faced by a rising number of older people in Japan, especially in the context of the plethora of (relatively) recent news media stories about people who fall out of touch with their families and effectively “disappear” only to then be found in their houses or apartments weeks after they die. That being said, the story has a certain quality of timelessness that allows it to function as a study of human character that transcends any specific social or historical context. I could easily recommend this book to anyone who enjoys highbrow horror fiction, regardless of whether they know or care anything about Japan. Dendera is gritty and compelling human drama. The story takes a number of interesting turns before moving in a surprising direction as it builds up to an ending that is magnificently transcendent. The unrelenting unpleasantness of its subject matter may not be to everyone’s taste; but, if your stomach is strong enough, Dendera is a thoroughly satisfying novel. 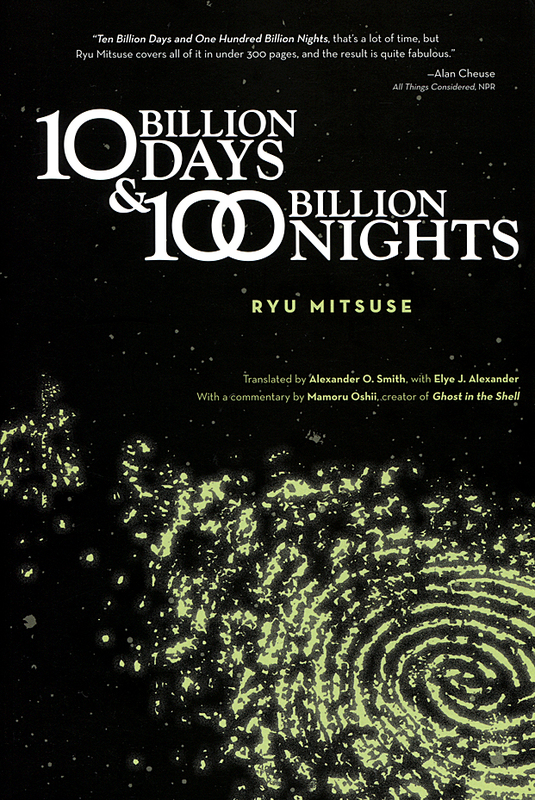 According to a 2006 poll published in Hayakawa SF Magazine, 10 Billion Days & 100 Billion Nights ranked at the top of the list of science fiction novels originally published in Japanese. I can’t say for certain whether 10 Billion Days is the “greatest” Japanese science fiction novel of all time (or what that would even mean), but it certainly is epic. The writing (and translation) are beautiful, and there are some interesting ideas floating around as well. Also, 10 Billion Days has an entire chapter devoted to a cyborg deathmatch between Buddha and Jesus. It’s awesome. This review will contain spoilers. The concept of “spoilers” doesn’t really apply to this novel, as its narrative tension is generated more by speculation and atmosphere than it is by plot, but be warned. If you’d like the point of the review here at the beginning, here you go: I love this book and you should totally read it. It’s not perfect, and it will try (and reward!) your patience, but it will stay in your memory for years. The short commentary by Oshii Mamoru (the director of the landmark animated sci-fi film Ghost in the Shell) is of interest as well, especially to fans of Japanese pop culture. The premise of 10 Billion Days is that all life on earth has been painstakingly curated by an extraterrestrial (and possibly extradimensional) entity that may not be benevolent. Some characters are aiding it, some characters are opposing it, and some characters are merely trying to understand it. What is clear is that our world is very small and unimportant on the sort of cosmic scale suggested by the novel’s title. After a prologue that sets the tone by emphasizing the eternal passage of time across aeons, the novel opens with a dramatic description of the struggles of the first fish to walk on land. At the end of the chapter, it is revealed that this creature is being monitored and gradually enhanced by highly advanced technology. The next chapter skips to Plato, who is seeking the mysteries of Atlantis. What he finds is that the gods are real, and frighteningly so. The next chapter focuses on Siddhārtha, and the next on Jesus of Nazareth. Both God and the Buddha realms are real, but these early seekers of truth can only see a fraction of the picture and describe it in terms they can understand. This passage is interesting not only for its lovely imagery but also because of its treatment of one of the main themes of the novel, which is that all civilizations will eventually fade into shadows of their former selves. This theme is visually translated at key points in the story, in which the spotlessly clean metal of a future space city is just as desolate as an ancient desert. Just roll with it, okay? Siddhārtha and Orionae (in other words, Buddha and Plato) are joined by a non-organic lifeform in the shape of an adolescent girl, who is called “Asura” after the eternally warring god-kings of the Hindu and Buddhist faiths. Asura had earlier revealed herself to Siddhārtha, claiming she is fighting the entity that Jesus understands to be God, and at the end of the novel she takes him and Orionae on a journey through space to meet and hopefully defeat this being. What follows is a series of battles and revelations that progressively mount in scope and impact throughout the last eighty pages of the book. Like the beginning of the universe itself, this novel is a massive explosion. 10 Billion Days is not a perfect book, and at times it moves through complicated and nuanced religious and philosophical topics quickly and with an absolute minimum of narrative grounding. I will also admit that I find the actual story unsatisfying. However, the strength of 10 Billion Days lies in the questions it raises in the mind of the reader. These questions are almost classically existential. In an uncaring and absurd universe, how can an individual find meaning and hope? The weekly speculative fiction magazine Strange Horizons will be hosting a roundtable discussion of 10 Billion Days in October, and I’m honored to be one of the participants. I have strong feelings and opinions about this novel, and I’m looking forward to learning what the other discussants think. There’s a lot going on in this book; and, if nothing else, it’s a fantastic conversation starter.